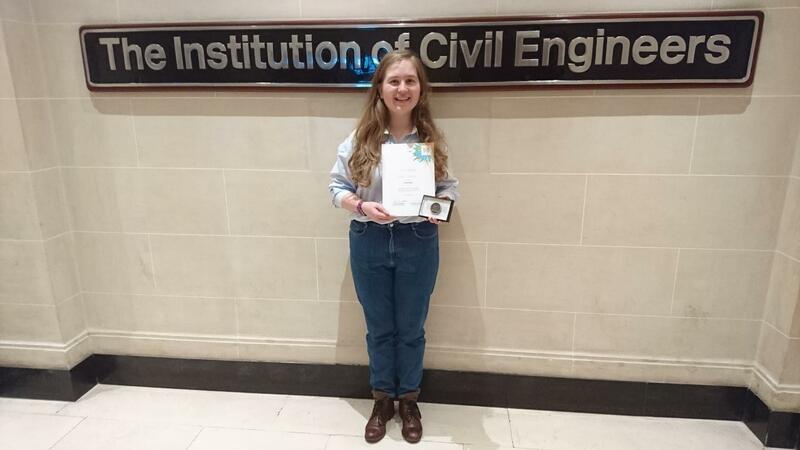 An engineering student from Heriot Watt University took home third place in the grand final of the Institution of Civil Engineering’s Pitch 200 competition. Catriona Salvini’s Great ICE Bake-off presentation used the analogy of baking Rocky Road squares to explain how concrete is made and showed the possibility of using other materials to increase sustainability. Taking place at ICE Headquarters in London, the Pitch 200 final featured heat winners from all over the world explaining an engineering concept in only 200 seconds. Cat’s practical kitchen-friendly pitch impressed the judges by demonstrating the similarity of using by-products of biomass energy production in cement mortar to baking Rocky Road. Cat said the whole experience had been great fun: “I came up with the idea when I was at home one day, baking, and was trying to explain my dissertation idea simply. Using food analogies seemed logical, and Rocky Road fit the best. The judges, Sir Peter Bazalgette, ITV chair and great-great-grandson of engineer and past ICE President Sir Joseph Bazalgette, Stephen Metcalfe MP, HM Government Envoy for Year of Engineering, Dr Marty Jopson, inventor and reporter for the BBC’s The ONE Show and Ayo Sokale, ICE President’s Future Leader 2017/8, said that Cat’s presentation was the “most brilliant analogy of the evening”. They liked the ecological approach of her presentation and were impressed by her knowledge about concrete structures and the longevity of their use. The winner, Imogen Graves of the West Midlands, beat 12 other finalists with a pitch using cakes and rich tea biscuits to show how demolition in construction works.